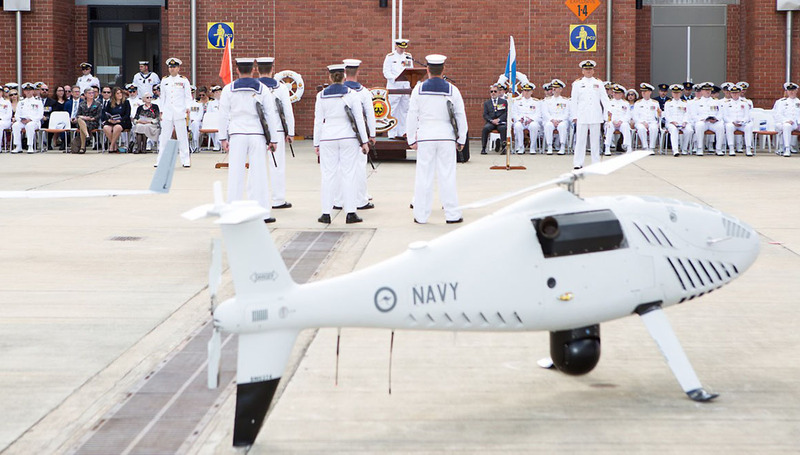 The ceremony, at HMAS Albatross near Nowra, marks the transition of unmanned aviation from the Naval Unmanned Aircraft Systems Unit (NUASU) to an operational squadron of the Fleet Air Arm. Thecommissioning parade was held to a backdrop that showcased the RAN’s long association with unmanned aircraft in the form of a Jindivik and a Kalkara. Both wore high visibility orange paint schemes, a testament to their roles as target drones, while in contrast, the modern aircraft of 822X Squadron carry inconspicuous, low-visibility schemes. The fixed-wing Insitu ScanEagle and rotary-wing Schiebel Camcopter S-100 are far smaller than their predecessors, and possess a far greater endurance in their role as tactical maritime unmanned aerial systems. 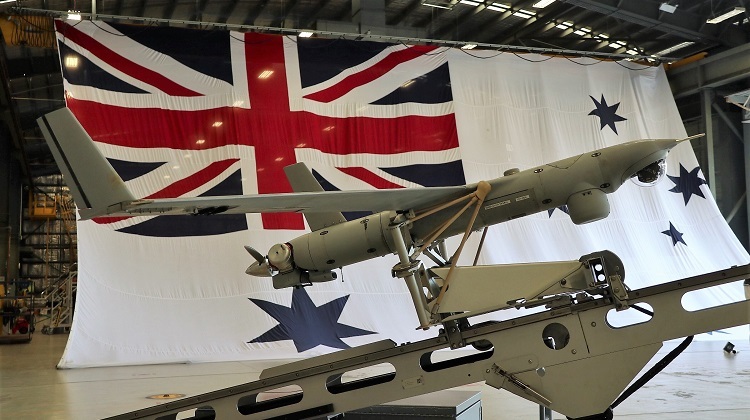 As reflected in the squadron’s motto of ‘See the Enemy’, the UAS’s core role will be that of intelligence, surveillance and reconnaissance (ISR), providing the fleet with high-quality video and still imagery in near real-time to significantly improve battlespace awareness. The commissioning service drew together the history and traditions of the RAN while also recognising that the squadron represents a very modern aspect of operations. 822 is a new number, not a revived squadron number as has often been the case in the past. While the ‘8’ in the squadron number indicates its operational status, the ‘22’ stemmed from the number of the unit’s first aircraft. (ScanEagle AV1422 flew with the callsign ‘ScanEagle 22’). Additionally, it is the first squadron to bear the ‘X’ suffix, to mark the developmental nature of the unit. 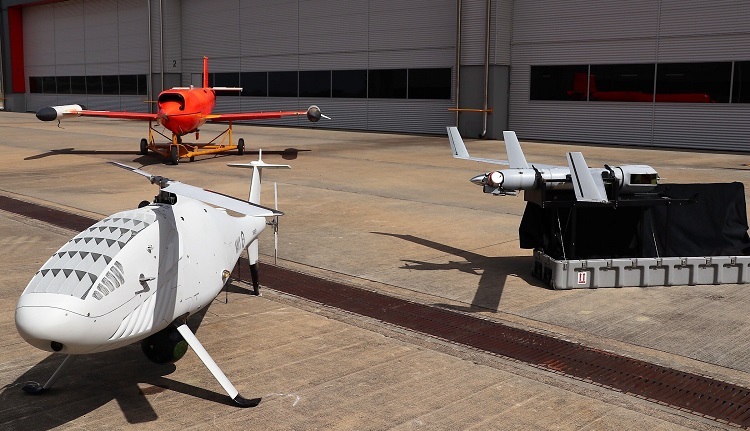 VIDEO – Schiebel and 822X Squadron predecessor the NUASU first conducted trials with the Camcopter S-100 UAS in 2015. Paying due recognition to naval aviation heritage, the squadron’s sponsor was Gwyneth Hall, the daughter of LTCDR Henry ‘Nobby’ Hall. LTCDR Hall’s naval career began in 1938 and spanned World War 2, service on numerous RAN ships, and saw him witness the Japanese surrender in Tokyo Bay. He transferred to the fledgling Air Branch in 1948 and his service ultimately covered 43 years of naval history, before retiring in 1981. Chief of Navy, VADM Mike Noonan addressed the gathered audience under blue skies, while the Commander Australian Fleet, RADM Jonathon Mead, read on behalf of the Governor General. With a four-ship helicopter flypast, the traditional ship’s company cheer and the commissioning of the squadron’s pennant, 822X Squadron was now commissioned.